Stamping with Loll: Happy Birthday Nikki! Hi everyone. Today I'm sharing the card I made for my DIL's birthday. I played with a new-to-me stencil from STAMPlorations. Love these butterflies --- they are so pretty! 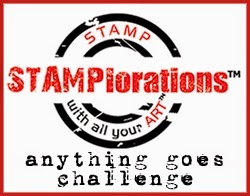 I'm heading over to STAMPlorations Anything Goes to join in the fun. I started with a watercolour sprayed background from my stash. The stencil was taped over the card and versamark was press on top, and then heat embossed in white. I sponged more picked raspberry to deepen the colours of the background, then sprayed with a shimmer mist on top. This is very sparkly in real life, but hard to capture in a photo. A white embossed sentiment on black finishes the card. 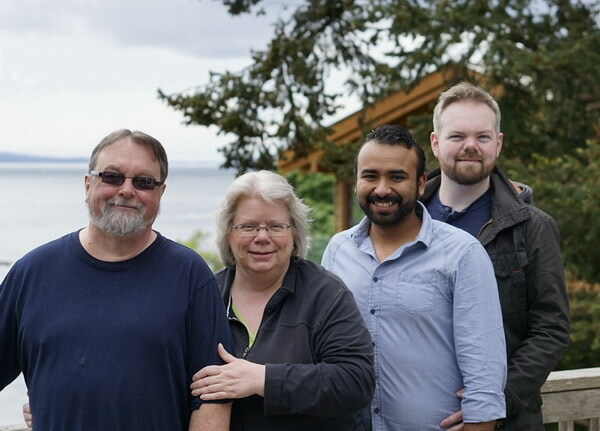 We are away on vacation this week on beautiful Galiano Island. The weather was sunny and warm at the beginning of the week, but cool these last few days with rain on and off. Jer and Alex came over to spend the weekend with us. It's been lots of fun. Awesome card and awesome pic!! Love your stencilled card, Loll!... Nice to see the picture of you all and that incredible breakfast! You all look like you are having a good time. Oh, what a gorgeous background! Perfect for those pretty butterflies! Glad to see that you had a good time on this island! Love what you've done with the butterflies and all the different techniques to create this pretty card. It's very graceful with the swoop of the wings and the coral color ways. Enjoyed seeing the picture of your family, and you all look very relaxed. Good to see that. The food looks yummy. Keep having fun, and hope the weather stays nice while you're away. TFS & Hugs. What a gorgeous card this is - very inspiring! Looks like you're having fun and yummy food - enjoy the rest of your vacation! 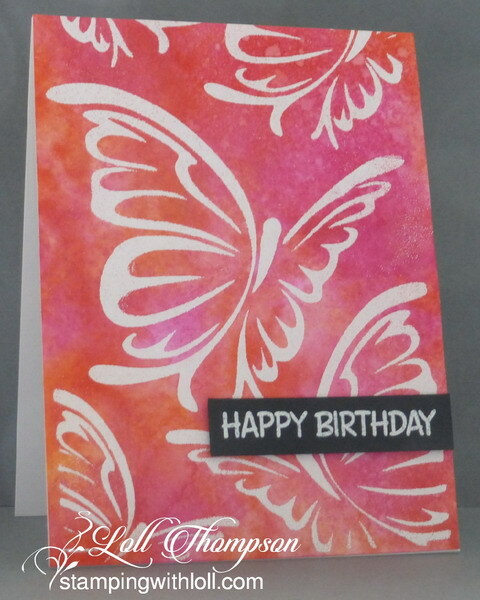 Beautiful card, Loll...wow, love those butterflies on this stencil, they have such movement to them! 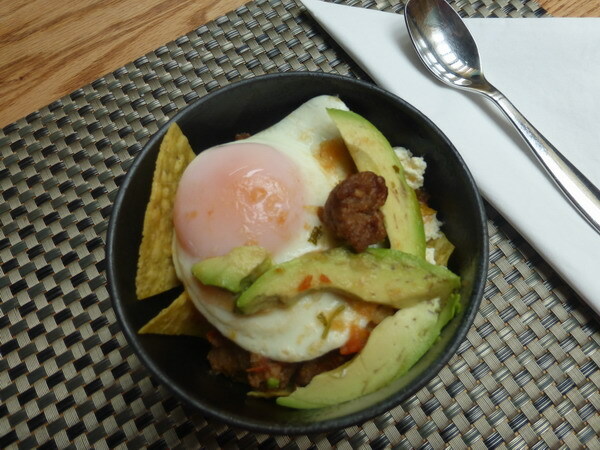 What a yummy looking breakfast, how great that someone else made it for you!! Your card is just beautiful, and I agree those butterflies are gorgeous. Hope you had a fun week, it sure looks like you had wonderful food to enjoy! I love that stencil and you made a fab card with it. Have a great holiday and hope the weather isn't too cold. We have snow forecast even at low levels as we are hit by Arctic air mid week!! Lovely photo Loll! Glad you had a great family time. So glad I saw that gorgeous card IRL as it truly is sparkly! Love the photo of the four of you - you all look so happy. I'm so glad you've had a great getaway on Galiano. Just beautiful...I love butterflies!!! And your choice of vacation spots is right on! Family vacations are so special...good for you. Oh, the breakfast...yummmm. Your background is absolutely gorgeous, and really makes these pretty butterflies shine, Loll! I'll bet it sparkles beautifully IRL, too! Pretty use of the stencil! Your vacation spot looks lovely -- enjoy your break! I love this stencil too, but haven't gotten it yet. I love how your card turned out Loll, it is so beautiful. The colors are so pretty and I bet too it sparkles in real life. The black sentiment strip just makes the rest of the card pop. Love it! I also love the picture of the 4 of you. Such a great picture with beautiful scenery too! Yes, you all look very happy!!! And your DH reminds me of my DH with his grey beard and smile. He looks like a gentle man just like my Dwayne was too. And that food, OMGosh, that looks so yummy!!!! Beautiful. I need to pull out some of my old backgrounds and start embossing. Thank you.